Disney has unveiled the final poster for Pixar's Toy Story 3, featuring almost every last character, over on Yahoo. Leading up the trailer debut, Pixar was introducing one new character at a time, but it looks like they finally went all out and said let's just show you everyone! Fortunately this poster is quite wonderful and I'm glad this is the one they chose to fully represent the movie in the end. I totally love that they don't have Toy Story written anywhere on the poster - they don't need it, this sells itself! 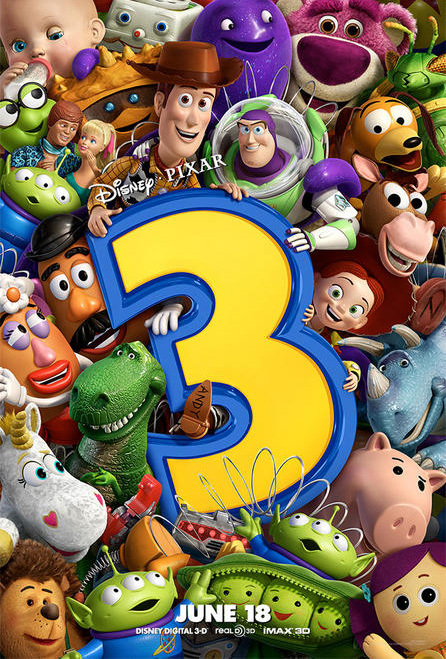 And I love that Buzz and Woody are holding onto the big #3 like they know they're a part of this. So much love for one simple poster - enjoy! really like this poster. actually has character and dosen't look like a photoshopped add. I reckon it'll have a pretty quiet opening weekend then maybe collect a small but appreciative audience, perhaps getting close to $60m for its final tally. I'm joking of course. i used to love that little phone. I have a feeling like this one is going to hit some childhood nostalgia moreso than the the first two. Where are the green army soldiers? I am extremely excited for this movie. I love the first two, not just because of the nostalgia, but because they're still great movies, for ALL ages. From one I've seen, this one should be great, too. Plus, it's a Pixar film. I bet this one will be the most emotional of the bunch; notice that Pixar ALWAYS leaves the emotional parts as something of a surprise to the audience, they never show those parts in the trailers. I'm glad, because I like for things like that to surprise me.